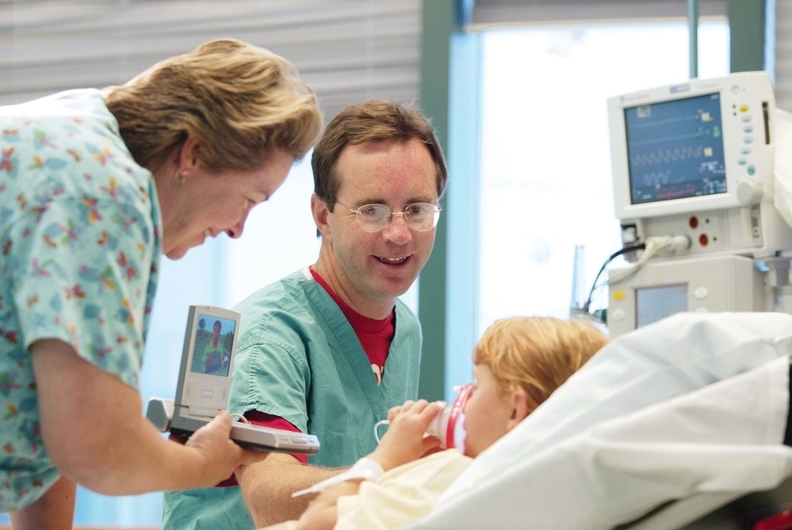 The Pain Free Program at the Children's Hospital at Dartmouth-Hitchcock works to individualize each child's experience to meet their needs and minimize their fears and concerns. The accountable care organization is loosely defined as a collection of doctors, hospitals and other providers who agree to take financial responsibility for the quality of care. Proponents argue they have great potential to improve healthcare value. But despite the consensus that healthcare needs to shift from fee-for-service into value-based models, no one has figured out the perfect model, including for ACOs. The more than 800 ACOs that now exist across the U.S. take on varying levels of financial risk and set different benchmarks for costs and different measures for patient outcomes. “What makes a successful ACO? As an industry, we don't know,” said Micky Tripathi, founding president and CEO of the Massachusetts eHealth Collaborative, a not-for- profit that works directly with three ACOs and also serves as a data warehouse for Aledade, a company that helps physicians form ACOs. Although the results from ACOs are inconsistent, these organizations are proliferating. At the beginning of 2011, the U.S. had 64 ACOs. That number climbed to 838 among public and private payers by the end of January 2016, according to the consulting group Leavitt Partners. This year, the Medicare's Shared Savings Program for ACOs has 480 participants in all 50 states, Washington, D.C., and Puerto Rico. But the fate of the ACO as a model is up in the air, and not just because of the political upheaval underway in the nation's capital. The latest data released by Medicare show that ACOs in its various programs, which include Pioneer and Next Generation in addition to Shared Savings, generated $466 million in savings in 2015—a fraction of Medicare's $646.2 billion total spend. What follows is a tale of two ACOs—one that survived a Medicare testing program and one that dropped out. Their stories reveal both the potential and pitfalls of an experiment that, given the level of investment made by hospital systems and physician practices over the past several years, will live on no matter the fate of the Affordable Care Act. Hospital systems and physician practices setting up accountable care organizations are generating mixed results. Whether you profit from shared savings will often depend on where you start-and that's a problem. UnityPoint Health, a $4 billion system with 43 hospitals across Iowa, Illinois, Wisconsin and Missouri, has a physician-led ACO that covers just under 100,000 Medicare beneficiaries in the CMS' Next Generation ACO model. Its ACO contracts with private payers, including United Healthcare and Blue Cross and Blue Shield of Illinois, and with its self-insured health plan encompass another 130,000 lives. By carefully tracking high-risk patients, targeting unnecessary costs and leveraging health IT, UnityPoint has trimmed unnecessary spending and improved quality in key areas, officials said. Since its founding in 2012, it has received approximately $24 million in shared savings and quality incentives through value-based agreements. In order to assess patients' risk profiles, the organization overlays data from claims and health records. The combination offers a “rich picture of what's going on in the population,” said Aric Sharp, vice president of accountable care for UnityPoint. For instance, providers use data to predict which diabetic patients are likely to be hospitalized in the next six months. They develop a preventive care plan and work with each patient to avoid unnecessary hospital admissions. UnityPoint also focused on post-acute care providers, using software to estimate the appropriate length of stay for each patient. It communicates its expectations directly with facilities, such as nursing homes, which often operate on a fee-for-service basis and have financial incentives to keep patients longer. In 12 months, the ACO has reduced the average length of stay in skilled-nursing facilities for Medicare beneficiaries by an average of 3.3 days, saving an estimated $4 million. The challenges UnityPoint faced as an ACO underscore the importance of aligning contracts with a health system's unique characteristics. In the early years of the Medicare Shared Savings Program, which it joined in July 2012, UnityPoint didn't do so well. It spent $966.7 million on 86,134 beneficiaries that first year—$12 million more than its benchmarked expenditures of $954.5 million. In the 2014 performance year, ACO spending again exceeded benchmark expenditures. It did not incur losses because that track of the Shared Savings Program had no downside risk. On quality measures, UnityPoint improved on some and declined on others from 2014 to 2015. Risk-standardized, all-condition readmissions fell slightly, for instance, but its score on a metric for the use of aspirin or another antithrombotic in ischemic vascular disease worsened. Sharp attributed the financial performance to the design of Track 1 of the Medicare Shared Savings Program, in which national benchmarks made it difficult for an organization with relatively low spending—which UnityPoint already had—to cut costs further. But in its contracts with commercial payers, UnityPoint's ACO earned incentives every year for reducing costs and meeting quality metrics, Sharp said. In 2015, its shared savings from Wellmark Blue Cross and Blue Shield (with which it does not have a contract this year), UnitedHealthcare and its self-insured health plan totaled $6.2 million. Shared savings are not necessarily an accurate metric for determining the success of an ACO, Sharp warned. Rather, the total cost of providing care to a population can be more revealing, he said, even though it is not reflected in shared savings. In 2016, UnityPoint was accepted into Medicare's competitive Next Generation ACO program, which took 21 participants. Its performance from the first year will be released later this year. Dartmouth-Hitchcock Medical Center's experience with its ACO highlights how the spending benchmarks set by the model, if not properly calibrated, can backfire. Dartmouth-Hitchcock, where thought leaders like Dr. Elliott Fisher developed the ACO concept, joined Medicare's Pioneer ACO Model with its at-risk shared savings program in 2012. The first year, the organization took homemore than $1 million in shared-savings payments while meeting quality benchmarks such as monitoring patients with chronic conditions. It covered more than 17,000 patients, spending $9,815 per patient compared with $10,501 for a national comparison group. But in 2013 and 2014, it lost $1.4 million and $3.6 million, respectively, even though the organization reduced per capita spending by 3.9%. Its total care costs had exceeded target benchmarks set by the CMS, requiring the ACO to repay Medicare. In October 2015, Dartmouth-Hitchcock dropped out of the Pioneer ACO Program citing unsustainable losses it said were due to its already low-cost operating environment—not from the actual care it provided. The benchmarks had two problems. One was that they weren't set until the performance year finished, so that the benchmarks could incorporate the actual spending of that year. For ACOs, it meant they could not see how their performances were being judged until after the fact. In other words, they were chasing a moving target they could not see. The other issue was that benchmarks were relative, tied partially to the ACO's baseline spending and partially to other organizations around the country. Those that started off with more excess utilization and spending had more room to succeed than those with low baseline use of healthcare services, like Dartmouth-Hitchcock. “It can't be a race to the bottom,” said Dr. Jim Weinstein, CEO of Dartmouth-Hitchcock. He pointed to spine surgery—a lucrative procedure that pays well in a fee-for-service realm—as an example. Dartmouth-Hitchcock had some of the lowest spine surgery rates in the country. It would have been detrimental to patients to attempt to lower them further, even if the ACO model created incentives to do so. “We can't go from one of the lowest rates in the country to a rate that's even lower that denies patients care,” Weinstein said. He called for targets that rewarded institutions that maintained low spending and utilization, not just those that showed progress by, say, lowering utilization rates from high to mid-range. Dartmouth-Hitchcock's ACO has fared differently with its commercial contracts, where it negotiated targets with payers. It faces similar challenges in lowering utilization rates, but it has a say in the standards by which performance is measured. These outcomes not only raise concerns for progressive, low-utilizing organizations like Dartmouth-Hitchcock, but also tough questions for the healthcare industry and the push into value-based care. How is a successful ACO defined, and does that definition correlate with the quality of the care being provided?